Nerf Machine Guns are easier to operate than hand powered blasters. Because the kids don't need to prime the blaster every time before firing. Most Nerf Machine Guns come with auto priming feature. It means the kids just need to load the dart drum or dart clip into blaster. Thereafter, they can start the blasting action on their opponents. When a kid is new in the world of nerf guns, s/he should buy an Nerf Machine Gun. It will help him fight back quickly in response to enemies' attacks. If the Nerf Machine Gun has more firepower then it will help you to demolish everyone and make your way to the victory. You must be thinking about how to find the Nerf Machine Guns which have more firepower or dart capacity. Here we will help you find such machine guns. Nerf Rival Nemesis Blaster is a part of Nerf Rival Series. 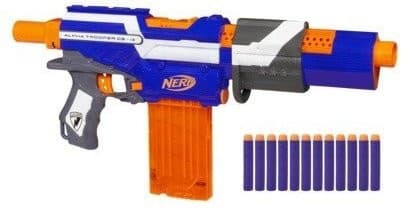 It is the second nerf gun with huge firepower (100 rounds) after Hail-Fire Blaster. This blaster does not fire darts, it has high impact rounds. The blaster comes with 100 yellow rounds and a hopper to load all rounds at once. Yes, you can load 100 rounds together in Rival Nemesis Blaster and finish all your enemies with rapid fire blasting. Nerf Rhino-Fire Blaster contains two large dart barrels on both sides. Each dart drum is able to hold 25 Elite darts at once. The blaster package includes 50 Elite darts and a tripod stand to steady the blaster. You can load all 50 darts in one time and attack on the opposite team to finish the mission. When you will attack with Rhino-Fire Blaster's rapid fire action, your enemies will have to die or surrender themselves. Nerf Rival Khaos Blaster is another powerful blaster from Rival Series. This blaster has a huge dart magazine to hold 40 high impact rounds at a time. You can easily remove the magazine and load all 40 rounds into it. Thereafter, insert the magazine into blaster and get ready for rapid fire blasting action. When you fire rounds from Rival Khaos Blaster, it goes at a velocity of 100 feet per second. Therefore your opponents have no chance to survive even if they are at a far distance. Nerf Infinus Blaster is a motorized blaster with speed load technology. It contains a huge dart drum at bottom. You can remove the dart drum to load 30 Elite darts at once. You can also load the darts one by one without removing the drum from blaster. Once the darts are loaded into Infinus Blaster, you are ready to dominate anyone in the battlefield and win the nerf mission. You should choose your desired nerf machine gun from the list mentioned above. The Rival Nemesis Blaster has the largest dart capacity of 100 and Infinus has 30 darts.